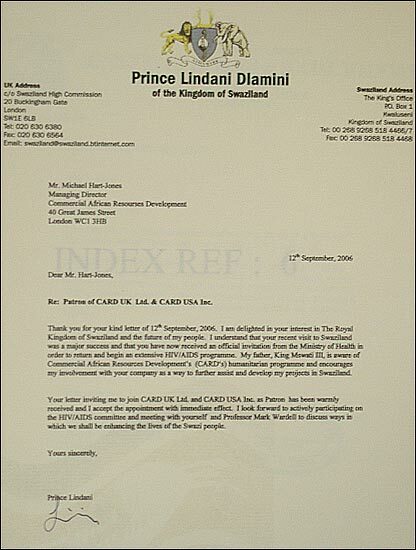 The documents obtained by Newsnight during its investigation into the selling of goats serum as an Aids cure. Excerpts from CARD business plan. 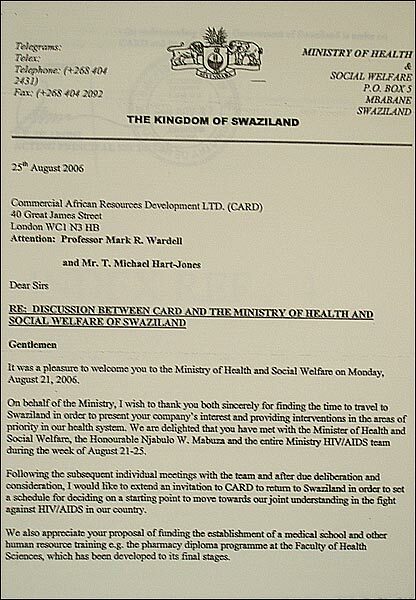 Most recently (August 2006), Dr. Wardell and Mr. Hart-Jones met with members of the Swaziland Government and received a formal invitation to undertake its HIV/AIDS program in that country (Appendix 4). During discussions with the doctors at the only HIV/AIDS clinic in Swaziland, the ART Clinic in Mbabane, CARD was invited to undertake a clinical trial with its goat antibody. Clinical Trials are contemplated; the first, a 9 month trial with 100 patients, and the second a 12 month trial with 400 patients (although the exact details of the second trial will be somewhat directed by the results of the first trial). In the first trial, the 100 patients will be split into three patient groups with 40 receiving CUI-9706 alone, 40 receiving a combination of CUI-9706 plus current antiretroviral treatment and 20 patients, serving as a control group, receiving only current-day antiretroviral treatment.